Download "College of Education and Psychology. Purpose and Values"
2 Core Purpose: Purpose and Values To prepare competent, caring, and qualified professionals in the fields of education, psychology and counseling and to advance the knowledge base in our respective disciplines. 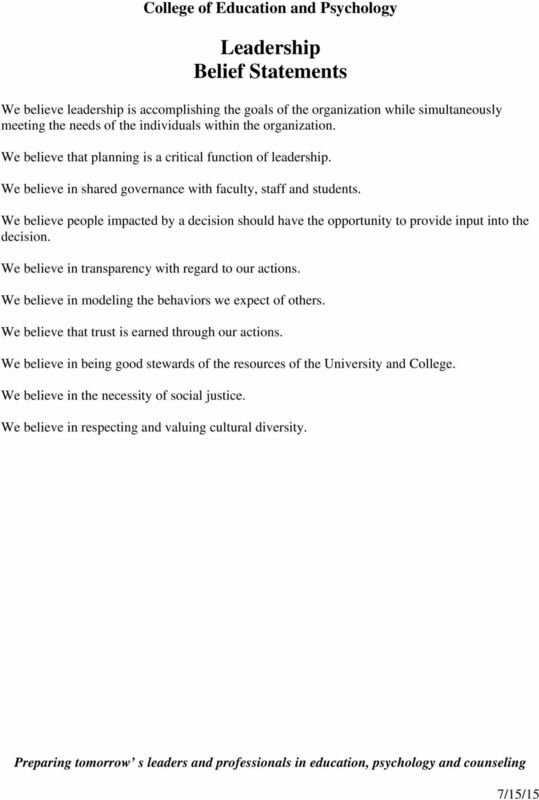 Core Values: Leadership: We will engage in shared governance with faculty, staff and students. We will provide transparency in our leadership. We will actively engage in obtaining resources necessary for faculty, staff and students to accomplish the mission and vision of the College. People: We will treat students and colleagues with respect. We will work collaboratively with our colleagues throughout the College and University. Programs: We will establish programs of study that are characterized by high standards of excellence while providing support to meet those standards. We will establish programs of study that are characterized by accountability through accreditation at state and national levels. Scholarship: We will engage in academic inquiry to expand the knowledge base in our respective discipline. We will disseminate the results of our inquiry through publication and conference presentations. We will secure extramural funding through grants, contracts and philanthropic endeavors. Service: We will be agents for positive change and social justice. 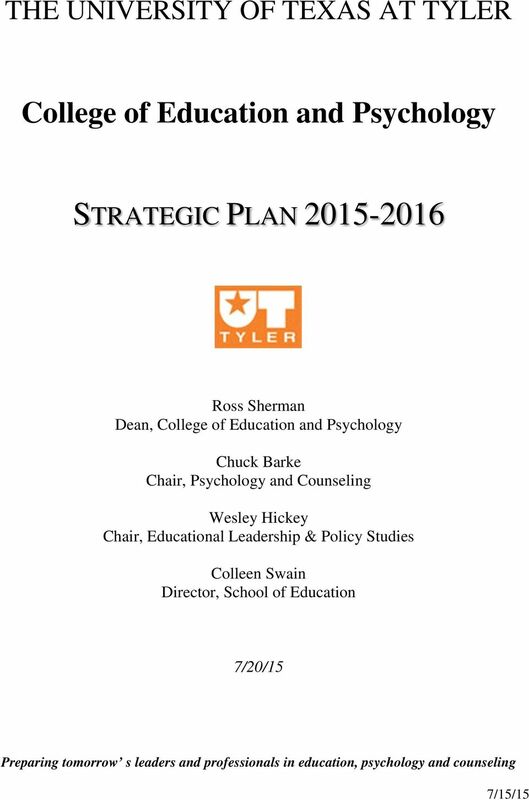 We will be productive citizens of UT Tyler. 3 Vision and Mission Vision The College of Education and Psychology is nationally recognized and respected for its academic programs and opportunities. It is a center of academic excellence, scholarly inquiry, and public service. The College prepares leaders to meet the critical challenges of the 21 st Century, to make significant contributions to local and global communities, and to work toward individual and cultural equity. 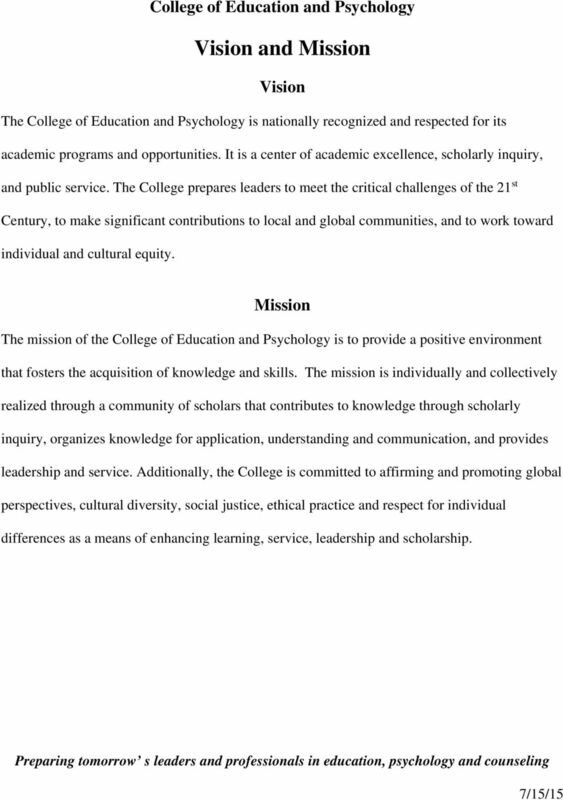 Mission The mission of the College of Education and Psychology is to provide a positive environment that fosters the acquisition of knowledge and skills. The mission is individually and collectively realized through a community of scholars that contributes to knowledge through scholarly inquiry, organizes knowledge for application, understanding and communication, and provides leadership and service. Additionally, the College is committed to affirming and promoting global perspectives, cultural diversity, social justice, ethical practice and respect for individual differences as a means of enhancing learning, service, leadership and scholarship. 4 Leadership Belief Statements We believe leadership is accomplishing the goals of the organization while simultaneously meeting the needs of the individuals within the organization. We believe that planning is a critical function of leadership. We believe in shared governance with faculty, staff and students. We believe people impacted by a decision should have the opportunity to provide input into the decision. We believe in transparency with regard to our actions. We believe in modeling the behaviors we expect of others. We believe that trust is earned through our actions. We believe in being good stewards of the resources of the University and College. We believe in the necessity of social justice. We believe in respecting and valuing cultural diversity. 7 GOALS Implement and strenthen plans to market/recruit aggressively for all programs. 2. Recruit more students from under represented groups to all programs. 3. Receive planning authority for a doctorate in Clinical Psychology. 4. Evaluate data on programs and degerees to ensure continued compliance and effectiveness in terms of all accrediation and accountability measures. 5. Maintain and disseminate accurate records of the accomplishments of faculty, students and alumni. 6. Publish on average in excess of one manuscript per tenure or tenure track faculty in professional publications. 7. Submit applications for extramural funding based on unit goals. 8. 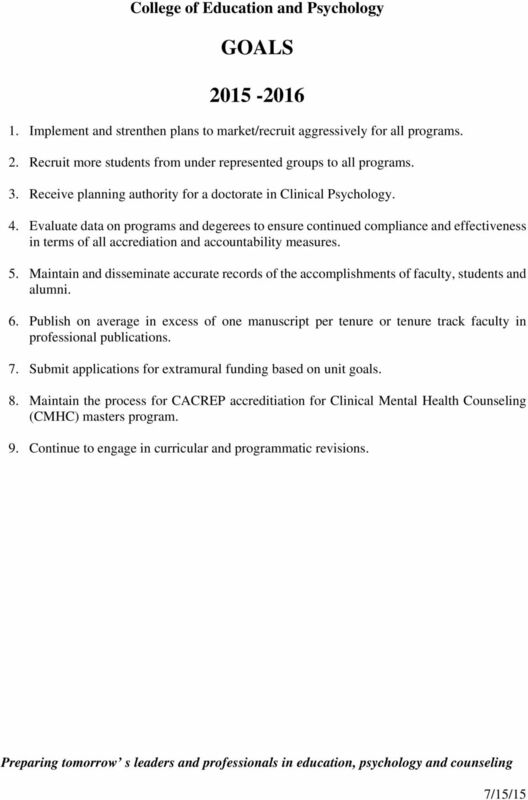 Maintain the process for CACREP accreditiation for Clinical Mental Health Counseling (CMHC) masters program. 9. Continue to engage in curricular and programmatic revisions. SMART. NIMBLE. COMPASSIONATE. PREPARED. SMART. Strategic NIMBLE. Plan COMPASSIONATE. 2013-2017 PREPARED. Draft Progress report. Objective 1 (Under the Education Pillar): Become the leading education provider of choice in selected areas. Draft Progress report Introduction: The vision of AUC is to be a world class university internationally recognized for its leadership and excellence in teaching, research, creative expression, and service. Position Specification. Texas A&M University. Dean, Mays Business School. August 2014. 2014 Korn Ferry. All Rights Reserved. The mission of the Graduate College is embodied in the following three components. The additional Political Science Program Standards, where relevant, appear in italics. 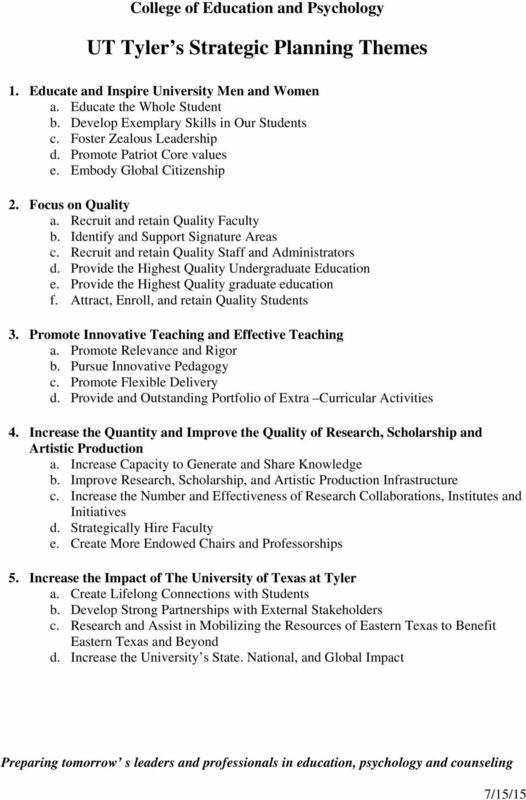 1 Political Science Program Standards Aligned with College Standards 5.00 COLLEGE STANDARDS FOR FACULTY EVALUATION The additional Political Science Program Standards, where relevant, appear in italics. Southern University College of Business Strategic Plan 2012-2017 Baton Rouge, Louisiana February 24, 2012 This document is the draft Strategic Plan of the College of Business for the period 2012 2017.